We’re still enjoying some really lovely autumn weather so what better to do than head down to the seaside and grab a coffee and cake? Apparently, it’s grab a coffee and some breakfast. A friend visiting from England was in urgent need of a sun (does anyone remember the less than stellar Easter?) and, as it made its appearance, we headed down to Brighton. I’d originally planned on coffee and cake (because cake is suitable at any time of day) but after a wander up and down Jetty Road and spotting scrambled eggs and smoked salmon on Brighton Jetty Cafe’s breakfast menu I was happy to change my mind. Of course, it transpired that we’d turned up at 11:50am and breakfast technically finished at 11:45am. But the waitress headed off to check with the kitchen and I’m pleased to report that commonsense prevailed and breakfast could, indeed, be served. Between us (that includes the baby) we had poached eggs on toast, scrambled eggs and smoked salmon and fruit toast. The fruit toast (which was two big thick slices for $4) was a huge serving and deliciously slathered in butter. And, miraculously, not all devoured by the baby so my friend and I got to sample it. The smoked salmon and scrambled eggs was great: loads of salmon, thick wedges of buttered toast, and a pile of hot eggs, scrambled and with a lightly fried finish. Personally, I like my scrambled eggs on the really runny side, but I am realistic enough to know I’m never going to be served eggs like that in a café. 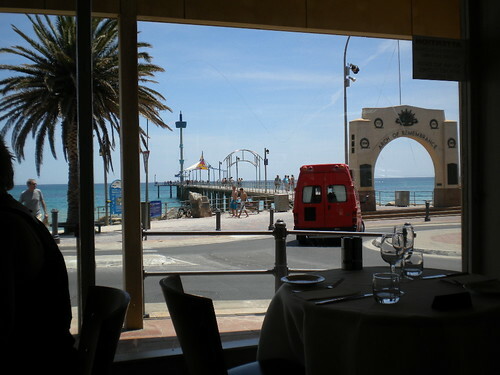 The eggs at Brighton Jetty Café were a good substitute. At the same price ($14.50) as those at etc I’d opt for those at the Brighton Jetty Café. My coffee was also fine and service was friendly and personable, with the baby’s high chair meticulously wiped down prior to use. It sounds silly, but these days so many venues are inflexible about rules (like the time breakfast starts and finishes) that I really rate those places that exercise some sane and autonomous decision making.